Description of "कहां कहां हरसिंगार रोप गए हो मास्टर साहब...!!! 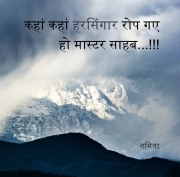 (eBook)"
The Book has nine stories in Hindi accompanied by pictures by Sunder Iyer. Most of the stories are women centric which tell tales of their gut and grit. Namita is an ex-banker who writes her own blogs. Has been writing and getting published stories and poems for years. She has also published a poetry Coffee Table book with pictures by Sunder Iyer. Reviews of "कहां कहां हरसिंगार रोप गए हो मास्टर साहब...!!! (eBook)"